Today is the feast day of St. Francis de Sales (1567-1622). Francis de Sales was canonized in 1665. St. Francis de Sales was known both for his medium as well as his message. St. Francis de Sales was named a doctor of the Church by Pope Blessed Pius IX in 1877 for works like "An Introduction to a Devout Life". 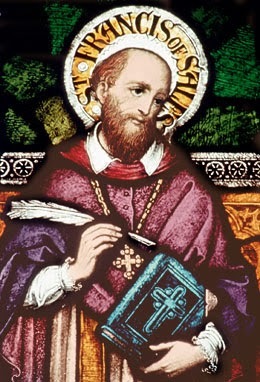 In 1924, Pope Pius XII proclaimed St. Francis de Sales the patron saint of writers and journalists (and now bloggers) since he extensively used media (flyers and books in his spiritual direction and his apologetics to convert Calvinists in the region. During his missionary work in Switzerland, Francis de Sales was able to help up to 70,000 people return to the faith. Aside from his prolific wring, St. Francis de Sales was known for his concern for writing with truth and charity. Hence, he is also considered a patron for Christian Unity. Through your prayers, St. Francis de Sales, I ask for your intercession as I attempt to bring the written word to the world. Let us pray that God takes me in the palm of His hand and inspires my creativity and inspires my success. St. Francis de Sales, you understand the dedication required in this profession. Pray for God to inspire and allow ideas to flow. In His name, let my words reflect my faith for others to read. Amen. Butte Blasphemy By Fanatical '49ers Pastor?